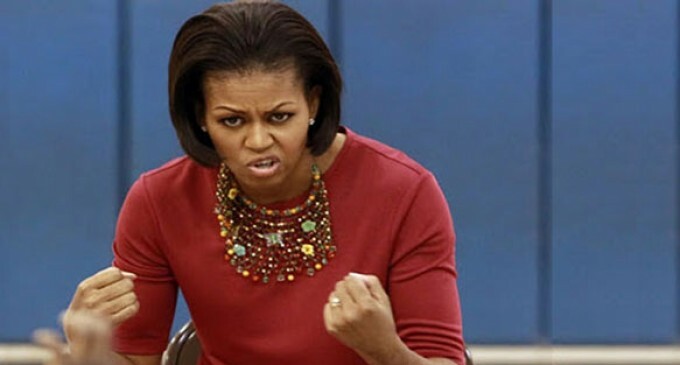 Parents of the graduating class of high schoolers in Topeka, Kansas successfully protested Michelle Obama’s plans to deliver a graduation speech to an exclusive audience. Their petition, containing more than 1,750 signatures forced plans for the high-security speech to be scrapped. First Lady Michelle Obama had planned to “celebrate the achievements of the graduating class of high school seniors in Topeka, home of the landmark U.S. Supreme Court case, Brown v. Board of Education, which is celebrating its 60th anniversary this year,” according to a White House statement. The parents were angry that security concerns would limit the number of friends and family who could attend. According to the Topeka Capital-Journal, students would have only be allotted six tickets apiece had the first lady maintained her original plans. The first lady’s address is meant to commemorate the anniversary of the landmark Brown v. Board of Education desegregation ruling. Looks like some of the sparkle is wearing off America’s ‘royal’ family, at last. Good for them , Moochle would have eat all of food. She is ugly on the outside and the inside. She is just as f**e as her husband!!!!! L.P.B. How many signatures on a petition will it take to get her to stay away from all of America? Good for the parents to say, Stay away. I cannot STAND this woman…nor her husband. I would love it if we could get THEM impeached and ran out of the country.